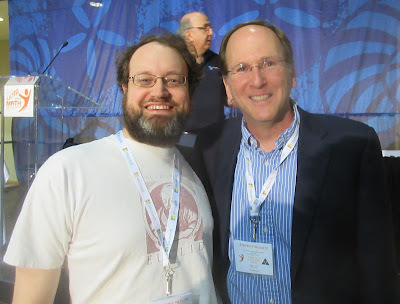 This year, I’ve tried separating out the keynotes from the rest of the sessions I attended. (You can find those at that link. OAME Ignite! is also going to be this separate post.) 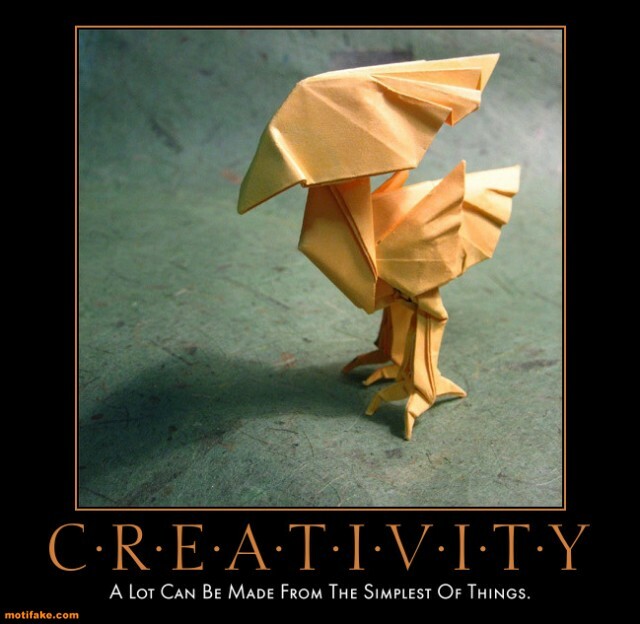 Continue reading to learn about origami, math columns in the New York Times, and Futurama. The Thursday Keynote was: “From Flapping Birds to Space Telescopes: The Art and Science of Origami”, by Robert Lang. (He’s given a TED talk on the subject.) Of note, before this began, there were dancers wearing mathematical operators in the large gym. The oldest known reference to origami was 1680 (ocho + mecho butterflies). Traditional origami often used cuts and slits. Folding as the primary means, and increasingly restrictive rules came later. In the middle of the 20th century, Akira Yoshiawa created a common language, using dotted lines and arrows to specify how folding occurred. The design is encoded in the crease pattern; math ideas got used. Some math includes: 1) Two-colourable (an unfolded model only needs two colours for no bordering region to have the same colour). 2) Mountain/Valley counting follows M-V=2 (or -2). 3) Alternate angles around a vertex sum to a straight line (odds/evens). 4) No self-intersection at overlaps (cutting through itself at a fold). Following the rules, you can start with a finished subject in mind and work backwards to see how folds could create it. Making a koi (fish) is a matter of repeating patterns to fold 800 scales (in 8 hours). On March 14 2012, Google had an origami doodle of their letters to commemorate Akira Yoshizawa. The bug wars! Making more horns. Colour use, one side of a page being red, the other side green. Working with symmetry and tesselations. “Girard’s Theorem”, giving a formula for the area of a “spherical triangle” (on the surface of a sphere). Ron Resch paper folding. Useful for deployable antennas (solar array) or telescopes - we need things small for the journey (into space) but large at destination (to gather data). We can get a 100 m lens folding down to 3 m (umbrella pattern). Such real world applications must account for “paper thickness”. There’s also medical applications - protein folding of tiny shapes. Magnetic/Light activated folding means an item (un)folds itself; also folding in water. The key is the fundamental laws of folding apply at ANY scale. There’s a documentary film “Between the Folds” (http://www.betweenthefolds.com) in multiple languages. So look up, and there will be origami looking down at you. At the end, Dr. Lang took questions, but I couldn’t hear because of people chatting at the back waiting to pick up lunches. Of note, Robert Lang also spoke before dinner. 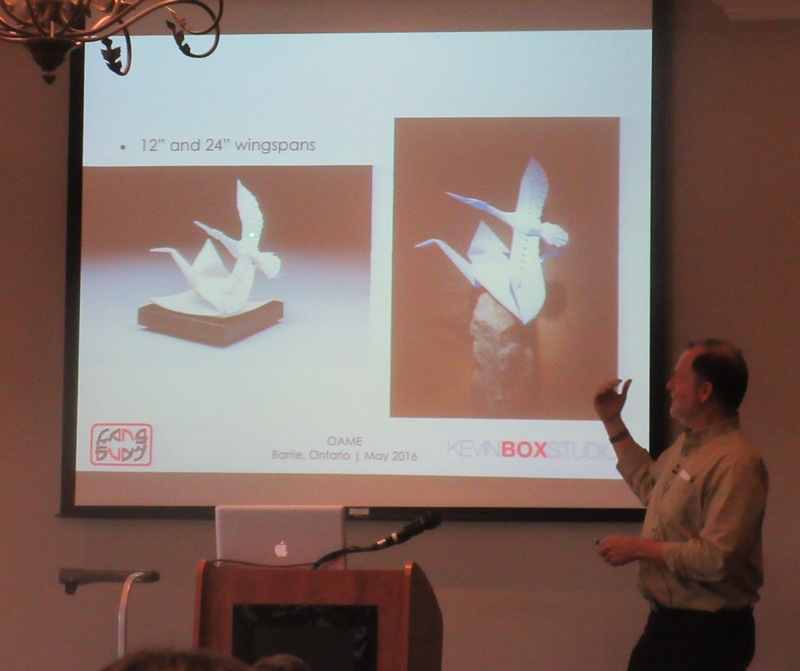 This time, he spoke about Kevin Box, a sculptor, in “Monumental Origami in Bronze and Steel”. Kevin does metal casting, which is more robust than paper, using an origami base. There’s “a simple 12 week 35 step process”. Lang and Box had collaborated on the “Hero’s Horse Monument”, scaling up from a paper model. First there was the question of “can it be done”, particularly after the decision to add wings onto the horse, in a design that was already specified to not have any cuts in the paper. Add to that the need to hold up to Texas weather, and working with an engineering firm. It is now on display. See http://origamiinthegarden.com for more on Kevin Box. Dr. Lang then led everyone through the process of making something which turned out to be a “Star Box”. (This is a squash fold... now repeat 399 more times...) They make perfectly fine hats also. Steven’s goal was to show the beauty, joy and power of math. Not to teach, but to show why it’s appealing - his audience being grownups, “who may have already been traumatized”. As such, he figured there were FIVE elements to consider. 2) EMPATHY, share confusion then get past it. He gave the “Uncle Irving” example of: If a bath fills in an hour with hot water, and in half an hour with cold water, how long will it take with both taps running? Some would say 45 minutes, but of course it can’t be more than half an hour. It can be done with equations, 1/30th + 1/60th is 1/20th, so 20 minutes. It’s the right answer but there’s “something puzzling about that technique”. Something psychologically confusing. Instead, think you can fill 3 bathtubs in an hour (1 hot + 2 cold), therefore unit rate is 20 minutes. Which fits with high/low estimate reasoning too (can’t be less than 15 minutes). 3) AHA!, people like a flash of illumination. He references one of the NY Times columns he received many emails about, the formula for area of a circle. From where? “Why do we have to wait until calculus? Because round things require calculus to do them properly.” He shows another way of looking at it. Drama! “In theatre, the main character gets in trouble, and that gets us interested. And then things get worse, before resolution. This proof is like that.” Chop a circle into four, and place the pieces with the rounded sides on the length, giving you pi*r (half a circumference) by r (radius). Note: Don’t say it has a curvaceous bottom to your students. 4) RELEVANCE, connecting to every day life. The Michael Jordan derivative; looks like he’s hanging? Steven spoke of Conditional probability and Bayes’ rule, which some said was the best article in the series, regarding breast cancer screening. 5) VISUALIZATION, to make abstractions more tangible. In this, Steven told us of a column that didn’t work as well as he thought: the Shortest Path between Two Points. (His 6th of 15 columns.) For instance, New York and Rome are at almost the same latitude, but the shortest path doesn’t fly due east. You curve north over the spherical Earth. Some people think that’s because “if something goes wrong, there’s always Nova Scotia”. We need to consider notions of distance on curved surfaces. Steven considered a torus; his wife recommended he say “donut” instead. With multimedia articles and a two holed torus, he had a graphing that traced a straight line road. Relevant since “light travels through the shortest space on curved space”. But some readers thought his series “jumped the shark” with that one. In conclusion, Steven found he could get away with two types of difficulty, the abstract, and the unfamiliar, but NOT both at once. Consider a horizontal axis (unfamiliar to familiar) and a vertical axis (abstract to concrete). Bayes’ Rule was unfamiliar, but concrete. Area of a Circle was familiar, but shown abstract. The “donut” was both unfamiliar and abstract, which was too hard. The final moral? Listen to your wife/partner/mother/friend. Saturday started with the keynote. “Good News Everyone: Mathematical Morsels from The Simpsons + Futurama” by Sarah Greenwald. See SimpsonsMath.com (not directly affiliated with the show, but referenced on DVD extras). It’s not a static product like a book, but can update as the show is still continuing (since December 1989; site up since 2001). If (a+b)^2 = 25 and (a-b)^2 = 45, what is a^2 + b^2? (I doodled this out to get ab is -5, so the answer is 35.) Extra challenge, draw 3 straight lines on an M to get 9 non-overlapping triangles. There are benefits and challenges towards using popular culture in class. Challenges: In pop culture, mathematicians are usually shown as having magical powers, not ‘I worked really hard, so you can get good the same way’. Humour is subjective, particularly lowbrow humour. (Is RDRR even funny?) There’s audio and video copyright issues. Student reactions vary between the SuperFans (who want/quote the whole episode) vs. First Timers. Is the focus the show, or the mathematics? But mostly “good news, everyone”: Laughter can overcome anxiety, leading to curiosity. Students connect and appreciate the cartoon quality. It’s creative and fun. Women and minorities are doing math too (diverse). How about PacMan geometry? (Seen in Futurama’s “Anthology of Interest II”.) The sides wrap, so cylinder, to torus as a slinky - but then not a torus, must reflection twist, towards a Klein bottle. “What is this useful for?” Students should ask that, I want them to. Does the Pythagorean Theorem hold in PacMan world? What does OUR universe look like? “The Horror IV” shows 1782^12 + 1841^12 = 1922^12, which is untrue, even if it holds for 8 leading digits. (Sadly, one of the first things seen at a college level was cancelling the power 12s.) “Wizard of Evergreen Terrace” presents another. Can also be debunked, consider odd versus even numbers. When asked about “inaccuracy”, David X. Cohen said it’s in the name of entertainment, we apologize and do respect science. 1729 (taxicab number) appeared in Futurama. Also inflation, with 93 cents at 2.25% interest over 1,000 years - given as 4.3 billion. There are many pi references, including 22/7, the “Fool’s Pi”. Johann Lambert (1761) has an elegant proof that there is no fraction representation: If x is a nonzero rational (fraction) number, then tan(x) is NOT rational. So pi must be irrational, since tan(pi/4) equals one. The list goes on and on. Simpsons is concentrating on innumeracy, and women in math, with Futurama doing more with science and engineering. The “Futurama Theorem” (from “Prisoner of Benda”) involves body switching, and was invented by a writer (based on group theory). Wrapping up, the ‘challenge question’ about M was solved, and there was a Jeff Westbrook quote: The skill of math is useful in the craziest places you might imagine. 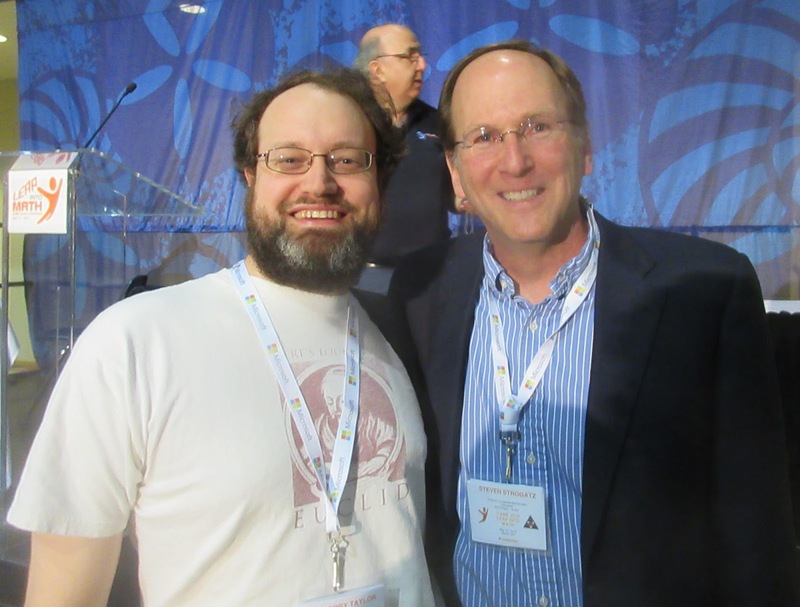 I hope you enjoyed reading about the OAME 2016 keynotes! Feel free to check out the rest of the conference and/or comment below.